Maximilan I of Austria – Diamonds are forever. Maximilian I (22 March 1459 – 12 January 1519), the son of Frederick III, Holy Roman Emperor, and Eleanor of Portugal, was King of the Romans (also known as King of the Germans) from 1486 and Holy Roman Emperor from 1508 until his death. 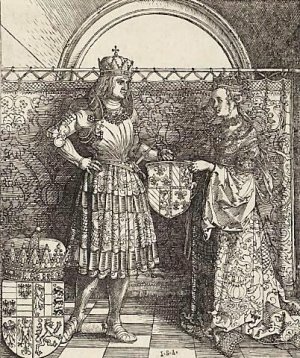 Maximilian was born at Wiener Neustadt on 22 March 1459.
introduction between Maximilans parents, Frederick III of Austria and Eleanor of Portugal. Maximilan I was good at fighting, but unfortunately not so good at gaining advantage from his military success. His father had always trouble with neighboring countries and cash flow problems and Maximilian I was the same, but he found a solution to this problem. The greatest enemy of Maximilian I’s, Frederick III, was Charles the Bold. 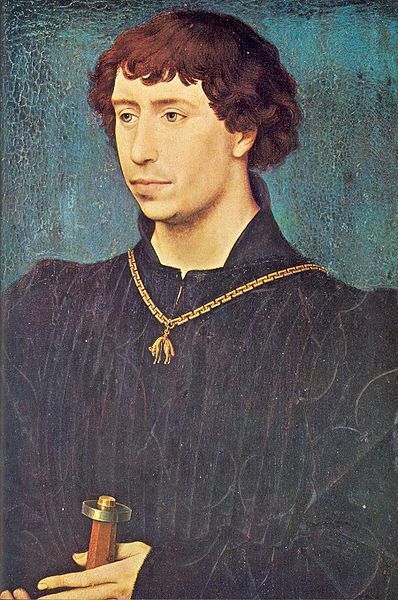 Frederick III hoped therefor to persuade Charles the Bold to let his only daughter and heiress, Mary of Burgundy, marry Maximilian I. Charles the Bold refused until he lost big against the Swiss in the siege of Neuss (1474–75). 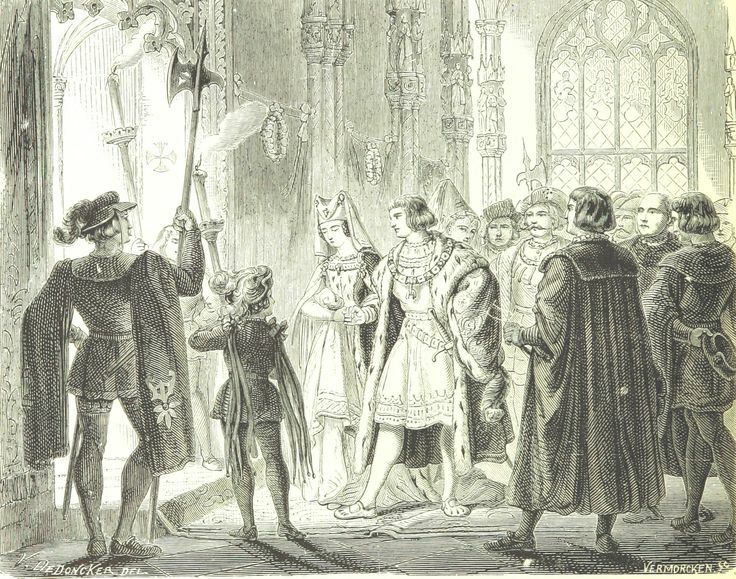 Charles the Bold needed a strong ally ASAP so now he wanted the wedding sooner rather than later. 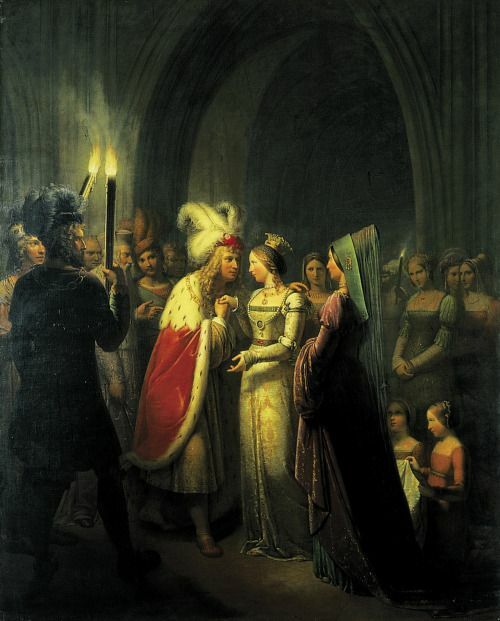 The betrothal was announced in 1476 and Charles wanted the wedding to take place as soon as possible. 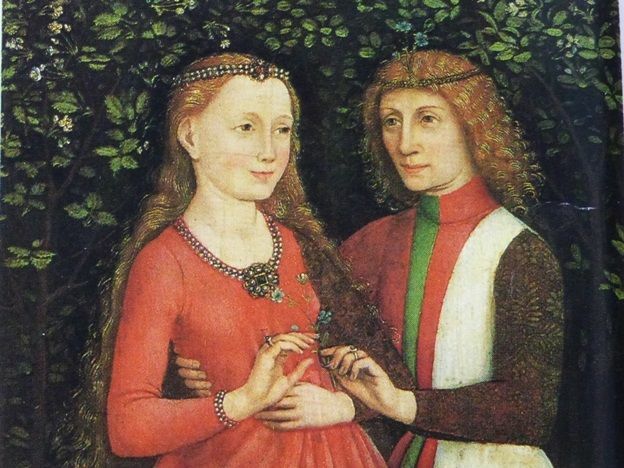 He asked his daughter for her approval by letter and Maximilian I also send her a letter and he sent a ring which is now considered the worlds first engagement ring. Maximilian I sent Mary of Burgundy a letter and an engagement ring. 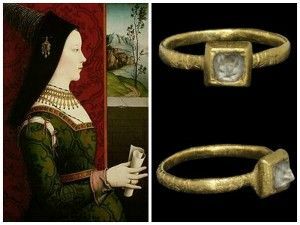 Mary of Burgundy received a letter by Maximilan I of Austria with an engament ring. 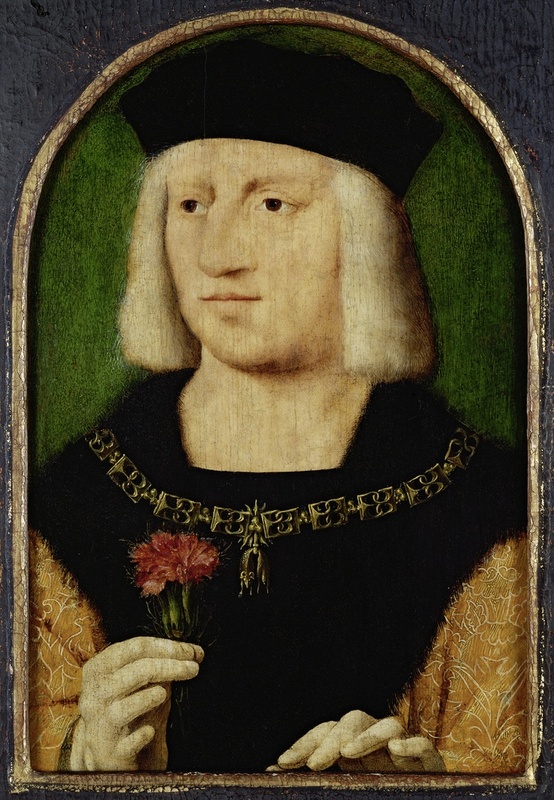 Engagement portrait of Maximilian I with flower to symbolize the engagement. Unfortunately Charles the Bold died in 1477 before his daughter and Maximilian I got married. The same year Mary of Burgundy married Maximilian I who was close in age to her, despite efforts of her uncle the French king Louis XI to more or less try to force her to marry his son and heir, (her cousin) Charles VIII who was just 6 years old at the time and 13 years younger than her! The reason that he wanted his oldest son to marry her despite his young age was the Mary of Burgundy was the heir of a lot of territories and he wanted that land for his son and future grand children. Now Maximilian’s children would get all that land instead of Charles VIII of France. Mary of Burgundy and Maximilian I of Austria with their Coats of Arms. Albrecht Dürer (1471-1528) — The Betrothal of Maximilian with Mary of Burgundy (Burgundian Marriage) Triumphal Arch in Barcelona ‘Ehrenpforte’, 1515-1517: National Museum, Nuremberg. 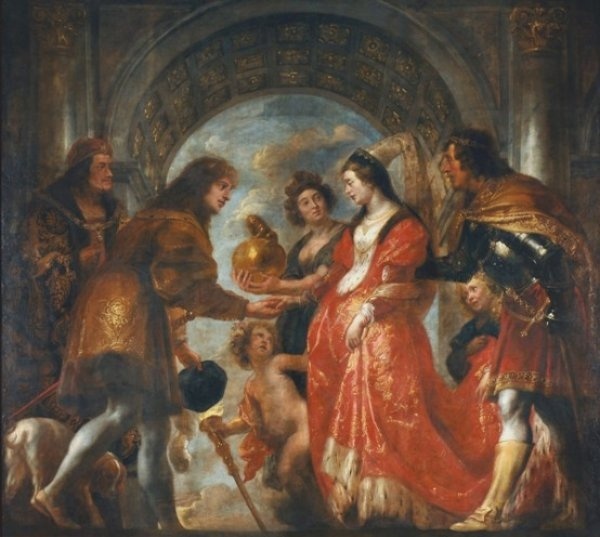 This painting by Jacob Jordaens of the Wedding of Mary of Burgundy and Maximilian of Austria was donated to the town of Sainte-Savine in 1954. 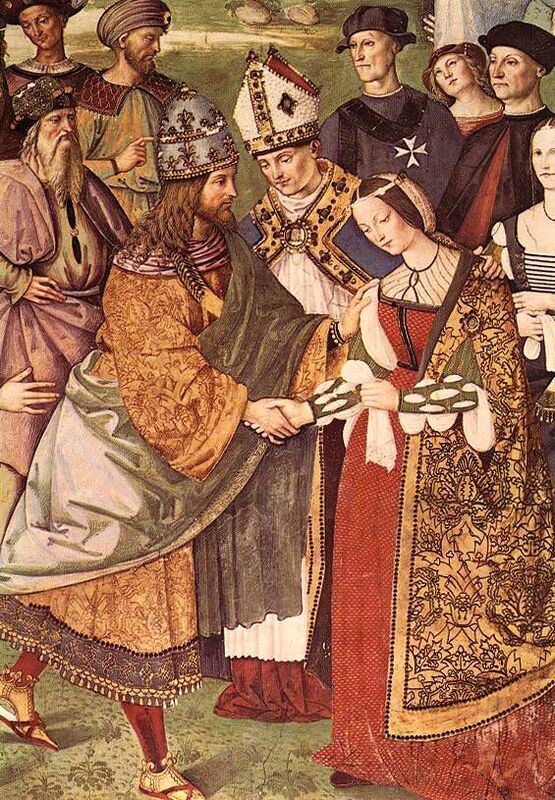 Marriage of Mary of Burgundy and Maximilian of Austria. 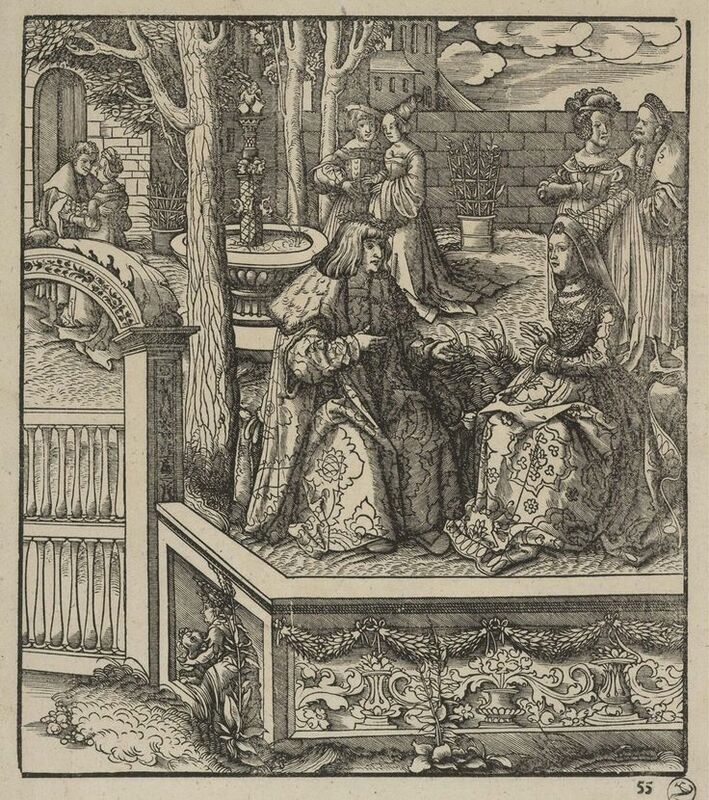 Marriage between Mary of Burgundy and Maximilan I of Austria. Wedding of Mary of Burgundy and Maximilian I of Austria. The Marriage of Mary of Burgundy and Maximilian actually made a lot sense. 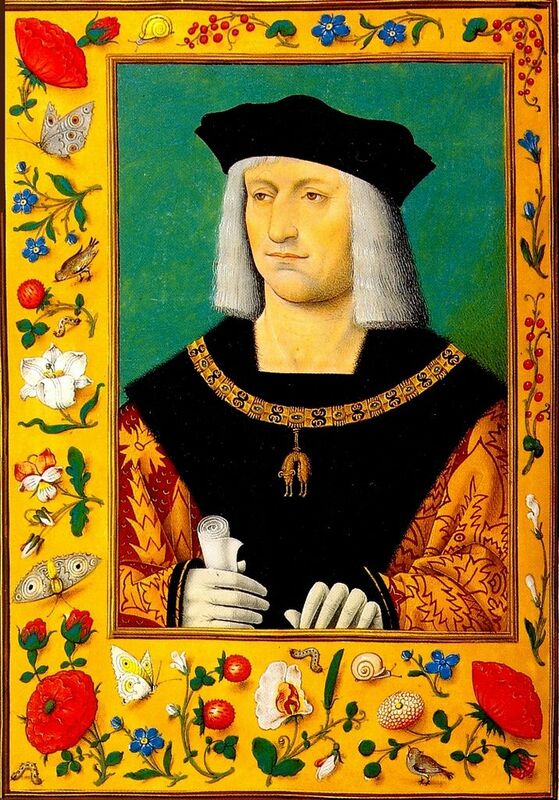 Maximilian had just like his dad economic issues and Mary of Burgundy was one of the richest women in Europe. Mary on the other hand was very rich, but also under a lot of pressure since her dad died before she got married and the French king wanted to exploit that situation. Maximilian was a good soldier and he did not like the French king so he could provide the muscles Mary needed. He was also much closer in age to her cause he was just 2 years younger. 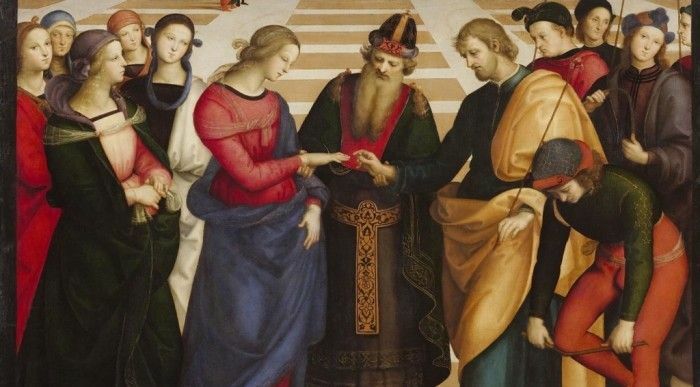 Maximilan I is thought to be the first in history to present his fiancee with an engagement ring. He gave it to her less than 24 hours before the wedding. Proposal to Mary of Burgundy by Maximilian I of Austria. 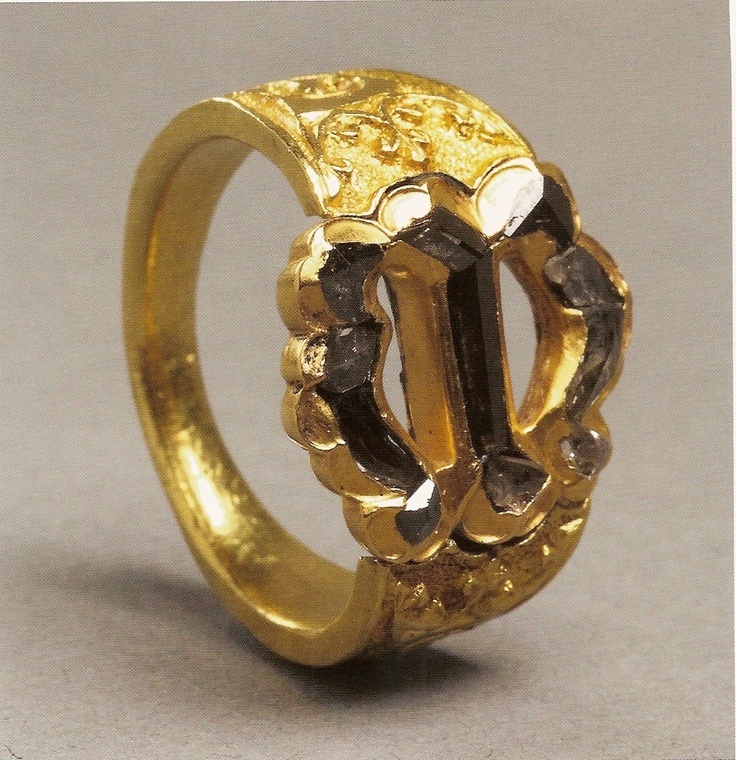 Engagement ring of Mary of Burgundy. That she was a bit spoiled isn’t surprising considering the privileged childhood she had as the richest heiress in Europe. She received a good education worthy of the most eligible heiress in Europe. She was to have every whim satisfied. She grew up with an ardent interest in animals. Her grandmother Isabel gave her a menagerie of monkeys and parrots. She had pet animals including a giraffe and dogs. She loved music, chess and art. She grew to love physical exercise, especially hunting, riding and falconry. She would skate on the frozen ponds of the Coudenberg Palace and hunt for hours. When Mary stayed in Brussels, she enjoyed the great deer park of Warende that surrounded the ducal palace. Mary of Burgundy as a child. But that didn’t seem to bother Maximilian I of Austria because he seem to have actually been in love with Mary of Burgundy which was quite rare at the time, because marriage at that time was usually strictly business especially for royals and nobility. 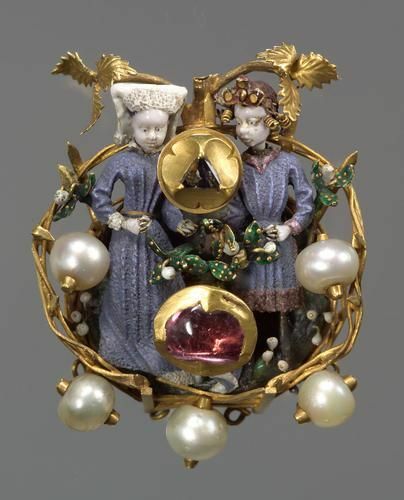 Engagement brooch of Mary of Burgundy and Maximilian I of Austria. Maximilian I wrote to a friend about Mary of Burgundy : : “I have a lovely good virtuous wife … She is small of body, much smaller than ‘die Rosina’, and snow-white. Brown hair, a small nose, a small head and features, brown and grey eyes mixed, clear and beautiful. Her mouth is somewhat high, but pure and red”. I beheld the gentle Mary, hunting with her hawk and hound”. Someone else commented: “Mounted on a large chestnut horse, clad in silver armour, his head uncovered, his flowing locks bound with a circlet of pearls and precious stones, Maximilian looks so glorious in his youth, so strong in his manliness, that I know not which to admire most—the beauty of his youth, the bravery of his manhood, or the promise of his future”. Marriage Maximilian I of Austria and Mary of Burgundy. 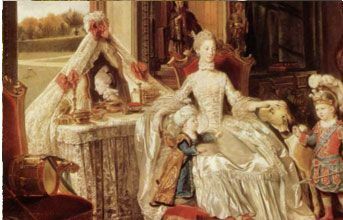 The Small Triumphal Car or The Burgundian Marriage. 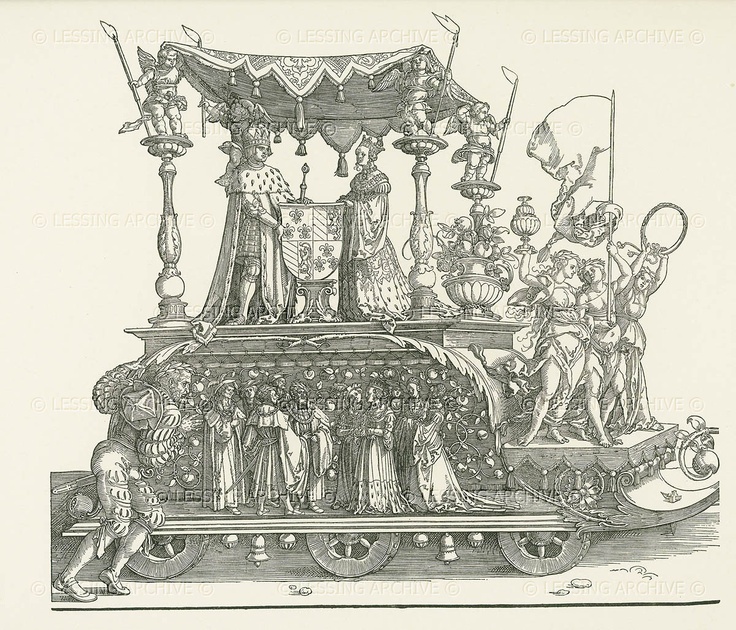 From the triumphal procession of Emperor Maximilian I. 1516-1518. 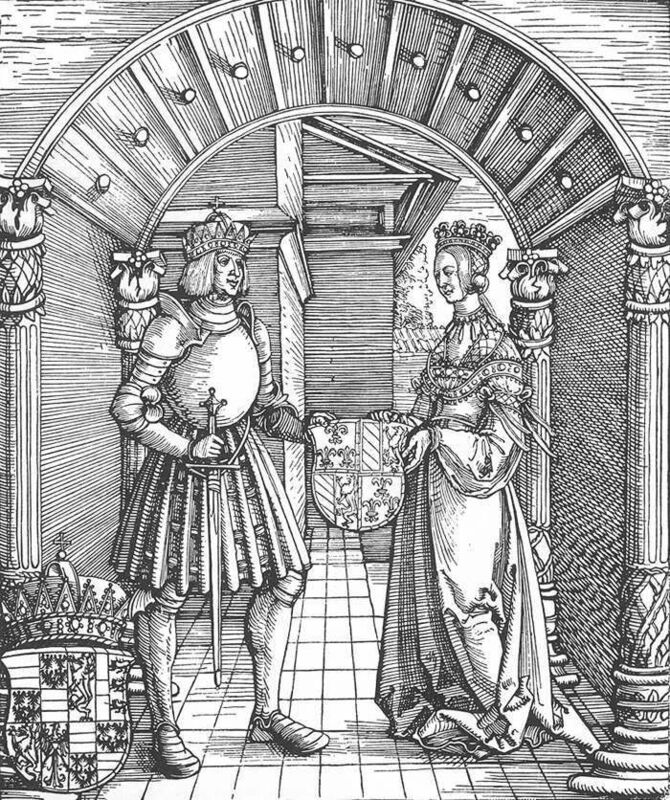 Maximilian as Duke and Mary of Burgundy holding the Burgundian coat of arms. The marriage is believed to have been very happy. They learned each others language and got 3 children together.